One of the things I’ve done for years now is help progressive, climate-action groups and people raise money online. Today is #GivingTuesday, so you can imagine that it’s been a bit of a whirl here at 198 methods. The idea of #GivingTuesday is nice – we all take a day out at the start of December, proximate to black Friday, cyber Monday, and other major moments in late America’s capitalist over-consumption, and we just … give. People donate to charities and non-profits of all sizes and kinds. Billions are raised on this day every year. And most of the groups I work with or know will ask for your help and raise some needed operating cash today. I’m doing that too – because we’re just getting our bylaws ready and filing as an official non-profit organization. And so, yes, it would be great if you can chip in a few dollars and help us expand our work in 2018. But I also want to do something a little different – because I think 198 methods is a little different. So I’m taking a step back to tell you why you should donate. Call it my 30,000 foot view. The world as I see it from where I sit today. And why I think that world needs one more non-profit environmental group (this one). Call it the story of the pipelines and the wave of people powered resistance people. 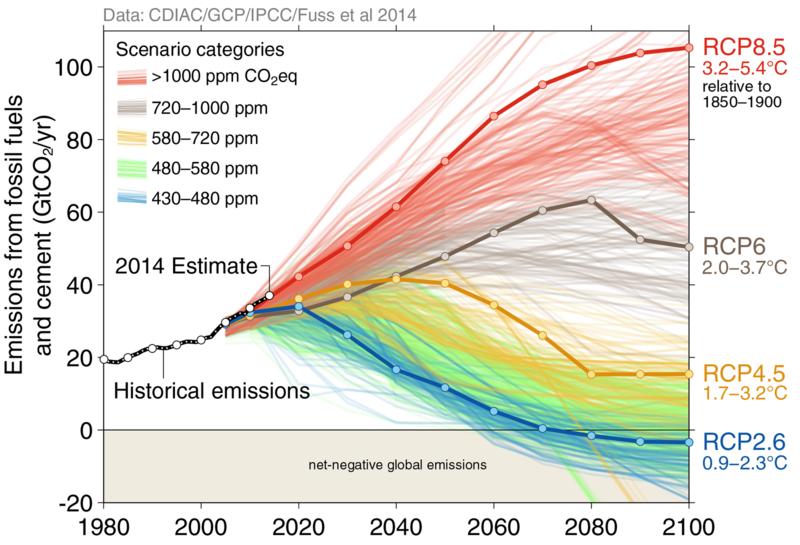 The problem is that we’re not doing nearly, nearly enough to cut global warming pollution. Only the blue lines on this chart indicate getting NEAR the cap on global warming pollution that every country in the world (except Trump’s America) has agreed to. 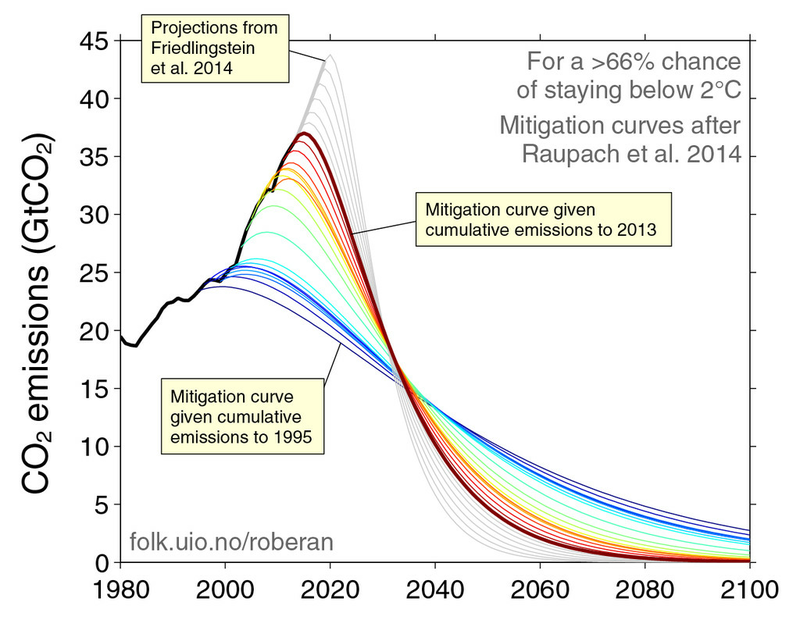 The red lines are 3-6 degrees C of warming, which makes most of the planet uninhabitable. Here’s another version of the same thing, this one showing what the US, in particular is doing, has said it will do (under the paris Agreement) and what we actually NEED to be doing. Here’s another take from the New York Times. The good news is that as bleak as things look, we actually have all the solutions we need. Solar and wind prices are falling dramatically, so are batteries and electric cars. Coal is going out of business even with all the help the Trump administration is trying to give it in the form of unfettered subsidies. Here’s 2 charts side by side from the same Guardian article that will raise your spirits. 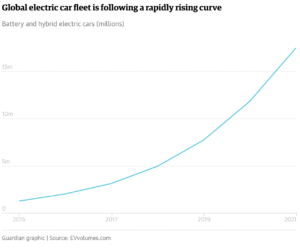 So is the global fleet of electric cars, according to the same article. The problem is, of course, that we don’t have an endless amount of time. In fact, every month and year we delay the action we need (effectively bending those lines down in the top 2 charts, and up, much more steeply in the second two) the changes get harder to make. Lake anything else in life (including me writing this message) the longer you put something off, the harder it is to complete the whole task by the deadline. This one is from Robbie Andrew by way of a real bummer of a D. Roberts piece in Vox. And it’s not just that we’re standing still, refusing to act. Oh no, not in the age of Donald Trump and his minions trying to rollback every law that protects public health, our climate or our communities. And they don’t stop at rolling back protections or opening up new and novel lands to drilling (not just BLM land, but national parks and monuments, even the Grand Canyon? Geez, guys, take it easy. What are you expecting to get impeached before your 4 years are up?). But that’s not all! Trump’s team, led by Secretary of Oops Rick Perry, has even proposed charging US ratepayers and extra $1 billion+ to subsidize nuclear and coal plants in a plan so outrageous, even the gas and oil industry are speaking out against it (Really, it’s so brazen, you have to read this Vox piece to believe it). But here is where the crisis becomes an opportunity. We know that the real reason Trump and his cronies (who mostly worked for the oil and gas industry before this administration) are so desperate to frack, drill, mine and defile every place they can right away is because they’re actually worried that they’re running out of time. What these people care about (all these people care about?) is money. And if the world starts to act on climate change like it means it (take a look at those top 2 graphs again) then the carbon bubble they’ve been sitting on for years is going to pop in a big way. 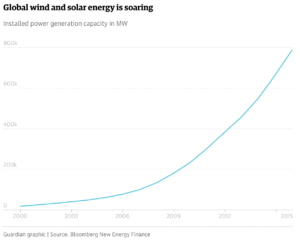 The only way they can cash in is to stop, or at least delay, the global shift to clean, renewable energy (those second 2 graphs). They know the party can’t last forever, so they have to get every last hydrocarbon out of the ground NOW while there’s still a chance to do it. In fact, they’re so eager to dig it all up, that they’ve over-saturated the US market with oil and gas. Which brings me, at last, to how I think we can win, and why I’d appreciate it if you can chip in a few dollars to support our work today. 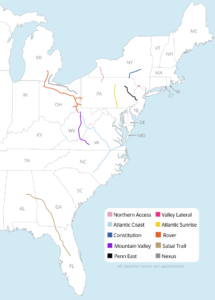 Take a look at this mash up of 2 maps – one a slightly older map of proposed Tar Sands Pipelines, the other just released today showing many (but not all) of the East Coast’s proposed gas pipelines. 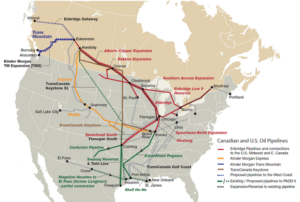 Tar sands on the left is a little outdated so doesn’t include DAPL, from Canadian Association of Petroleum Producers via this blog. The gas map on the right is from today’s E&E news. This isn’t all the pipelines, export terminals and new fossil fuel infrastructure proposed in north America. But it is a lot of it. 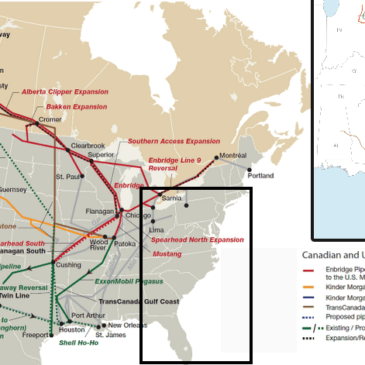 When I look at that map, I don’t just see the pipelines and projects threatening so many communities. I see their vulnerability. If we can delay, disrupt, and derail these pipelines — even just for a few months — we can significantly increase their costs and give the clean, sustainable power options we need time to catch up. Even more fun than outrage, I met lots of folks at last week’s People Vs Oil and Gas summit who are ready to build the future we want – clean, sustainable, just and led by women of color – right in the path of these pipelines. And then dare the Trump team and their fossil fueled backers to try and come drag us out of that better future. That’s what they’re doing in Nebraska with Solar XKL, in Pennsylvania at Camp White Pine, and are about to do a lot more of in Louisiana and lots of other places. I want 198 methods to be there to help – to use our smarts and digital tools (like this stuff) to raise money, drag attention, and connect fights all across North America into one big movement for change. But to do that, we’re going to need money. Not a lot, but a little. There’s a little over $500 in our bank account right now. I’m hoping to raise $10,000 by the end of the month to have a lawyer look over our incorporation paperwork, buy some additional software and storage space we need to scale up the project, and get started on some cool new projects with our friends (which I’ll tell you more about next week, since this is already too long). Chip in here to help.